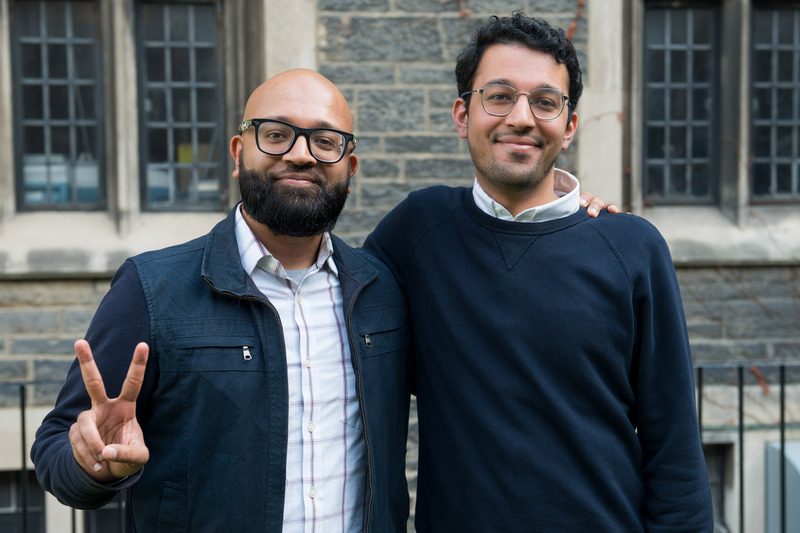 Following the story of a group of Muslim morticians in Newark, NJ, the brother filmmaking team Zeshawn and Aman Ali learned invaluable lessons regarding death, faith, and community. Their ITVS Open Call funded Two Gods allowed them intimate access alongside their participants Furquan and Nas, giving the Ali brothers a space to work together and focus their talents on the Muslim community. ITVS: What inspired you to take on such a powerful story? Where did you begin? Aman: Speaking for myself, as kids we often didn’t really see people that looked like us on TV and in cinema. Something we’ve talked about a lot is representation. We always ask, “Does that really sound like someone in that community?” We are very sensitive about that and lead with that sensitivity in our work. Zeshawn: We started having an idea of doing profiles of unexpected narratives in the Muslim American community. We came upon this casket shop and met Rashad, who owns the shop, and he mentioned sometimes he has kids who he brings into his shops to work with. We thought that this was fascinating and Furquan, one of our main characters was there. We didn’t go into it thinking we’re making a feature. We just went into it thinking, “This is an interesting person and experience.” It was an organic process. What was the most challenging part of making the film? Zeshawn: Exploring spaces that are often unseen and talking about things that aren’t often talked about. It’s challenging to make a film where people are dealing with death and there are a lot of raw and vulnerable moments. There have been many times that we had to leave the room and have conversations with people, but that’s not something that can be planned. It’s a unique challenge creating a film around death. There are times where we are just there for people - that’s how we built trust within the community. Our favorite parts of the process are the bonds we have made with people. It’s been a very nontraditional process. We feel like we are giving ourselves as people. The film deals with grief, morality, and faith. How did you portray these themes cinematically? And what led to the choice of making the film in black & white? Zeshawn: A way to contextualize the grief in the film is seeing it through the eyes of these kids. Death is used and portrayed as empowerment because it’s unique to these people and this place. Black and white is something that is traditionally associated with sadness but is beautiful and has its roots in coming-of-age narratives. We feel that it builds the film visually and brings the film to life. Zeshawn, how did your faith influence your process of directing the film? Zeshawn: I am Muslim American and in these communities that we’re filming in there is a lot of skepticism. Because the news is usually sensationalized and focused on violence associated with the Muslim community, people are naturally suspicious. I’ve learned to have a lot of patience. We end up praying with the characters and going to events at the Mosque. It’s been amazing to share that similar background. There is a comfortability and ease in that. Furquan (13) and Nas (17) are so young. What was it like directing them? Aman: It’s always a challenge because you’re asking an open-ended question, but kids give you straightforward answers like, “How are you?” “Good.” We’ve been filming with Furquan since he was twelve, and he really just wants to be a kid, so we follow him riding his bike and playing. When we let them be themselves in their environments, they are [at their] most raw, candid, and honest. Zeshawn: 13 and 17 are very different ages. At 13, you have no filter. We let Furquan guide us into his world as he showed us how he navigated his home and environment. We would just be like, “Okay, we’re going to roll the camera.” Being a 17-year-old, Nas likes to keep his cards close to his chest. He’s much more composed in the way that teenagers are. But our characters have different associations with where they are in life - it’s an interesting challenge interpreting what a moment of silence means for a 13-year-old compared to a 17-year-old. We were very excited to receive an application from Two Gods. Why did you pick ITVS for funding and what was the application process like? Aman: We’ve worked with ITVS in the past on projects such as 30 Mosques in 30 Days. We were familiar with their mission and the content that they like to promote. ITVS lets storytellers be themselves and helps fulfill the missions of those storytellers, so it was right up our alley. It was a no-brainer when we put the application together. We had [gone] to a couple of film festivals and met with ITVS, so we knew what the application process was like. You two are brothers. What is it like working with each other? Are there certain storytelling strengths that one of you has that the other does not and vice versa? Aman: It’s nothing but fun. We see things very differently. He looks at things from a directors’ point of view as in, “This is what looks beautiful.” As the producer I’m like, “Okay - this is what is popular.” The greatest thing about us being brothers is that we never take criticism to heart. I’m not going to hold a grudge against him because there is a mutual sense of respect between us. Early on we saw the challenges, but at the end of the day I am the producer and he is the director. Ultimately if he feels strongly about a certain vision then I’m going to respect it and stay in my lane. Zeshawn: Although we have those designated roles we are both in tandem with each other. We know each other so well and can communicate without using words a lot of the time on set. When you’re working on a project together there is a lot of navigating of how to keep it professional. I think it helps the characters to trust us because it creates a familial feel on set with everyone in it together. What do you want viewers to take away from Two Gods? Zeshawn: It’s about seeing and feeling the intimacy and vulnerability of the characters and the communities. We wanted to break the mold as far as what we think this kind of story could be. We infuse it with a lot of life although we tackle a lot of death. The characters speak for themselves and we wanted to capture that kind of up close and personal feel. We don’t often see films like that about people from our community. Aman: We’re presenting a community in religious traditions that is probably very unfamiliar to the average viewer. We’re storytellers at heart, but we want people to approach these subjects with a sense of nuance. When it comes to Islam there is a lot of talk about hate crimes, but often the principles of Islam aren’t really discussed at all. We hope viewers appreciate watching an intimately spiritual tradition, such as the Islamic burial process.